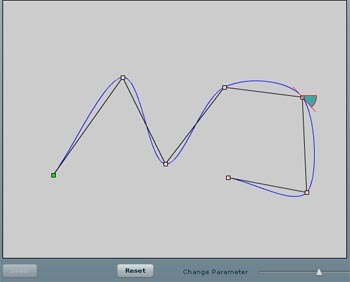 Just a quick update that support for closed-loop C-R splines has been added to Degrafa. The algorithmis is the same one as used in Singularity and is documented in this TechNote. The algorithm is designed to provide G-1 continuity at the join and works best if the knot sequence approximately represents a closed shape. If the outermost knots are ‘pointing away’ from each other, behavior is unpredictable. The current implementation is targeted towards a use of defining a single knot set with closure and no further modification. It is not possible to add knots to an already closed C-R spline. It is not currently possible to re-open the spline after closure. These constraints are based on discussion with designers on most likely usage. They are subject to future modification if people come up with applications that require closure and then re-opening of the spline. <mx:Canvas id="background" x="50" y="90" width="500" height="320"
knots="150,230 230,170 370,210 390,320 280,360 160,320"
Not much here and not really worth a demo. Update SVN to access the new source. Progress has been slow with regular work and dealing with family issues, but the Degrafa BasicSpline class now supports (interpolative) parametric splines as well as Cartesian. The previous CatmullRom utility was used to ‘decorate’ BasicSpline to create a plottable Catmull-Rom spline that can be described in MXML. A screenshot of the basic demo is shown below. A note about the demo – there are a fixed number of points used in the point-to-point plot, so it can be a bit grainy for splines with really long arc length. The Degrafa spline is drawn segment-by-segment. Click the space bar to compare vs. the C-R utility plotted point-to-point. I have not yet implemented the closure as I’m thinking about making it close and re-open. Update SVN if you want to access the source. The computational basis for the spline is in the PlottableCubicSpline class which implements the IPlottableSpline interface. The integration into the Degrafa geometry pipeline is handled by BasicSpline. The basic idea is to supply an external utility that conforms to an established interface to handle the spline computations. A reference to the utility is used to ‘decorate’ BasicSpline in a simplistic sense. This makes it possible for people to author splines for Degrafa without having to understand much about Flash or the internals of Degrafa. Currently, BasicSpline is only functional for cartesian splines. To preparare a set of test cases for parametric splines, the old Singularity Catmull-Rom spline has been ported to Degrafa as two utility functions. One is a straight Catmull-Rom spline (with auto-closure) that conforms to the IPlottableSpline interface. 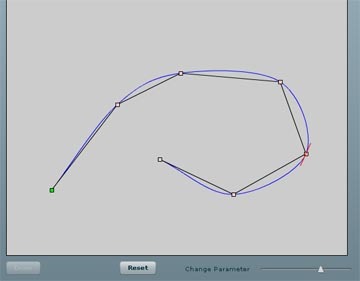 The other extends the base utility to include approximate arc-length parameterization for use in path animation or keyframing (where the path is not intended to be drawn). A simple demo is available to illustrate the utility. Click in the draw area to define a few points, then hit the space bar. The spline is plotted old-school (point-to-point) to illustrate the path. A set of markers is distributed along the path at roughly equal intervals of arc length. A Degrafa ellipse is drawn and animated along the path. The ellipse is also oriented to follow the path. A screen shot is shown below. Like I said, it’s a pretty simple demo, but it should give you an overview of how to use the new utility. An SVN update is required if you want the new source.